The heavens declare the glory of God; and the firmament shows His handiwork. Day unto day utters speech, and night unto night reveals knowledge. There is no speech nor language where their voice is not heard. Their line has gone out through all the earth, and their words to the end of the world (Psalm 19:1-4). One of the many wonders in the heavens is the celestial (a word that means “in the sky”) object that we call the Moon. There are many moons in the Universe, but when we talk about “the Moon,” we usually mean our planet’s moon. Consider what the Moon does. First, it often provides light at night. 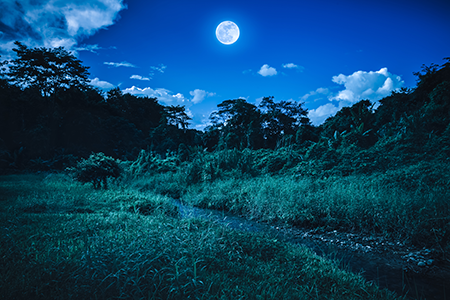 Have you ever been out in the country where there are no visible manmade lights, and yet you can still see “in the dark” because there is a full Moon? Though the Moon is “the lesser light to rule the night” (Genesis 1:16), it is capable of reflecting a large amount of useful light. Along with the Sun and stars, God set the Moon “in the firmament of the heavens to give light on the earth, and to rule over the day and over the night, and to divide the light from the darkness” (Genesis 1:17-18). Second, for thousands of years the Moon has been of great help to man in keeping track of time. Like clockwork, every 29½ days the Moon changes from totally dark to totally light—from being a “New Moon” to a “Full Moon." The lunar calendar is based on the Moon’s cycles throughout the “year.” Many people (especially in Arabic countries) still use this kind of calendar. Not surprisingly, Moses wrote 3,500 years ago that the Moon and other celestial bodies help with tracking “days and years” (Genesis 1:14). Third (and perhaps most important), the Moon plays a vital role in helping Earth remain a hospitable place for life to flourish. How is that? The Moon’s gravity and Earth’s gravity pull on each other. 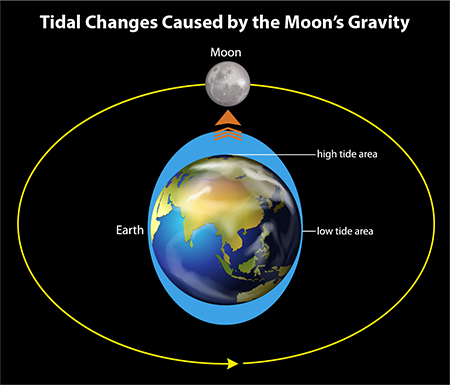 The Moon’s pull on Earth causes the movement of the oceans—making the tides rise and fall. If not for the Moon being on average 240,000 miles from Earth, this “just-right” movement of the waters would not be able to cleanse the shorelines, stir up the waters, and support the great amount of life both in and out of the water (which often depend on each other). Atheists admit that they do not know how the Moon came into being, but one of their “best” theories is that another planet collided with Earth billions of years ago. This accidental collision is said to have produced a large number of rocky fragments that began orbiting Earth. Eventually the remains clumped together at high temperatures. Over the years, the new celestial body of clumped material cooled and became Earth’s Moon. Does this theory by atheistic evolutionists really make good sense? No way! Accidents don’t produce the kind of design we see in the Earth and Moon. The Moon had to have been “set” by Someone in just the right spot in the heavens to help control the movement of the Earth’s oceans. That same Someone gave the Moon its predictable pattern that it follows every 29½ days. The fact is, the amazing design of the heavens (including the Moon) “shows His [God’s] handiwork.” The Moon, like all of Creation, is a result of the mighty hand of our all-powerful God. “O Lord, our Lord, how excellent is Your name in all the earth, Who have set Your glory above the heavens…. When I consider Your heavens, the work of Your fingers, the Moon and the stars, which you have ordained…. Lord, how excellent is Your name in all the earth!” (Psalm 8:1,3,9).